This set of Biochemistry Question Bank focuses on “Biosynthesis of Cholesterol, Steroids and Isoprenoids”. Explanation: The receptors for steroid hormones reside at nucleoplasm. Explanation: Steroids have sterol nucleus but lack the alkyl chain attached to the ring D of cholesterol. Explanation: Prenisolone and prednisone are chemically steroids. Explanation: Isoprene units are the essential intermediates in the pathway from acetate to cholesterol. Explanation: The first intermediate in cholesterol synthesis is mevalonate. 6. How many carbons are present in HMG co-A? Explanation: Two molecules of acetyl co-A condense to form acetoacetyl co-A, which condenses with the third molecule of acetyl co-A to yield six-carbon compound HMG co-A. 7. Which of the following is the major point of regulation on the pathway to cholesterol? Explanation: HMG co-A reductase is the major point of regulation on the pathway to cholesterol. 8. Which of the following is the integral membrane protein of smooth ER? Explanation: HMG co-A reductase is the integral membrane protein of smooth ER. 9. How many carbons are present in geranyl pyrophosphate? Explanation: Geranyl pyrophosphate is a 10-carbon chain. 10. Which of the following regulates female reproductive cycle? Explanation: Testosterone and estrogens which influence the development of secondary sexual characteristics in males and females, respectively. Glucocorticoids help regulate gluconeogenesis and reduce the inflammatory response. 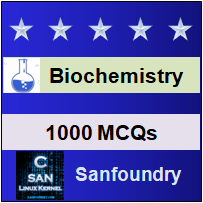 To practice Biochemistry Question Bank, here is complete set of 1000+ Multiple Choice Questions and Answers.